“Quote board! Quote board!” someone calls, hurrying across the room to scribble the line down on the patch of whiteboard space designated for surreal overheard snippets of puzzle-solving-related conversation. Above the list of quotes is the phone number for event HQ. To the right is a hesitant dry-erase depiction of what might be a constellation, or possibly a Japanese character. Further down the board is a list of team members and their puzzling strengths, so everyone knows who to notify if a cryptic crossword or a programming puzzle shows up. It’s the afternoon of Saturday, September 10th. 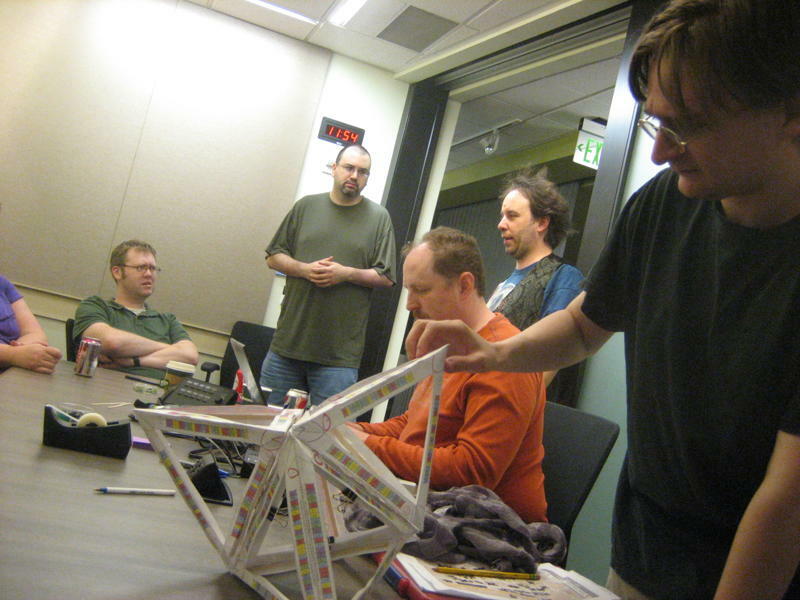 The scene is a conference room on the main Microsoft campus in Redmond, Washington, and the event is Microsoft Puzzle Hunt, a quasi-annual weekend-long team-based puzzle competition. Each team consists of 12 people, at least four of whom must be Microsoft employees. There are 81 teams this year. Our team, Chameleonic Life Forms–No Thanks (a Red Dwarf reference) is new, made up partly of MSPH newbies and partly of overflow from another team that grew too big. That team, Death of Dr. Zero, is the team we’re aiming to beat. 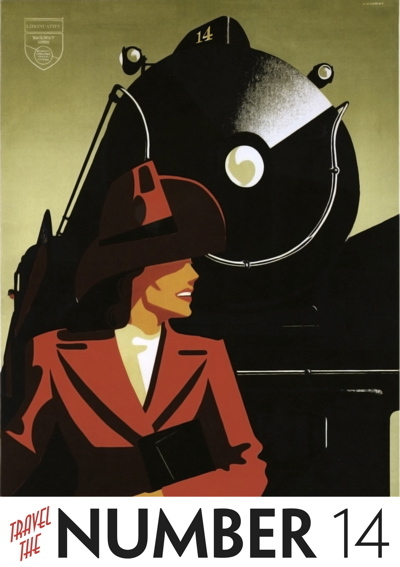 Beside this warm welcome is an illustration of a train engine behind a red-clad woman reminiscent of Carmen Sandiego. Our team files into a row of seats, careful to avoid getting stuck behind the Silly Hat Brigade team, whose adherence to their title makes them difficult to see past. The event kicks off with an overview of the rules, presented in a highly entertaining little video that intersperses a sternly lecturing train conductor with scenes in which an elderly woman with a paisley laptop explains to a younger woman what constitutes acceptable behavior at a puzzle hunt. (Sabotaging other teams with computer viruses, we learn, is not permitted.) The video gets lots of laughs and a cheer at the end. Then comes our introduction to the hunt itself: an FBI case assignment marked “Mildly Confidential” comes up on the screen. It tells us in halting typewritten text that the Space Needle has been stolen, and it’s our job to get it back by chasing the thief across the country on a series of virtual train rides. 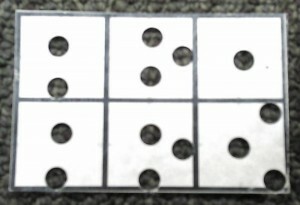 We’re instructed to open our envelopes, which contain three identical hole-punched tickets divided into six segments each. 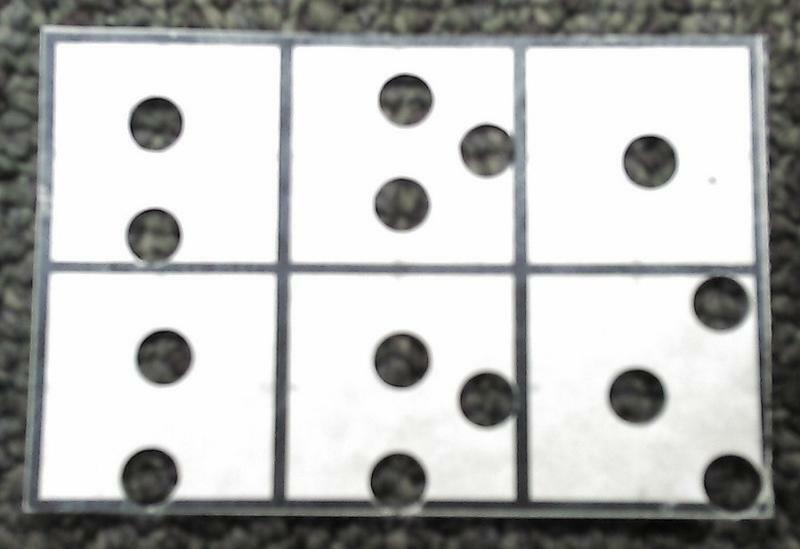 A member of our team notices almost immediately that the holes are positioned to form letters out of the white space around them, yielding the answer ABOARD. We turn in our answer at the registration desk and receive a manila envelope containing our first round of puzzles. Back in our team’s conference room, we open the envelope to find a stack of puzzles ostensibly set in various locations around Seattle. They require us to assemble pentominoes into Braille-bedecked rectangles, identify board games based on Chuck Norris facts, anagram words with themselves, recognize company logos, figure out almost-palindromic phrases, solve a crossword overlaid with Morse code, find a hidden semaphore message in a CD of train-themed music, do a triply-recursive word search, and play Twister with monkeys. The train ride from one city to the next is scheduled to take a very long time. However, for every puzzle we finish, our arrival time is moved significantly forward. This combination of the actual passage of time and puzzle-solution-induced acceleration soon brings us, according to our progress map, to Los Angeles. Along with the new city comes a new round of puzzles. One of them appears to be a list of Magic: The Gathering cards, but in a somewhat malevolent move on the part of the constructors, turns out to be about sports teams. We have a secret weapon, though: one of our team members, Matt Tabak, is both a Wizards of the Coast employee and an avid sports enthusiast, and he takes out the puzzle with ease. A puzzle based on hidden color names is unexpectedly easy, and when we type in the answer we find out why: the answer-check system instructs us to make an appointment with Game Control for the real puzzle. We’re directed to a conference room in another building, where someone from GC turns on a Kinect and leaves us alone to figure out what’s going on. Two stick figures with three colored squares along each arm appear on the screen, and two of us must manipulate them with our own bodies to combine colors in a way that matches patterns shown on the edges of the screen. Partway through, the rules change, and we get stuck for a while before we realize that now we have to combine the color values of both stick figures to make the pattern. The answer extraction uses Braille again. Fortunately, we were warned before the hunt started that this particular constructing team likes to use a lot of codes, and we have plenty of resources on hand. The Chicago round comes out, bringing with it the Duck Konundrum we’ve all been expecting since we saw “a duck, live or otherwise, or an object which can stand for a duck” on the list of recommended supplies. The Duck Konundrum is a type of puzzle that was invented by Dan Katz in the MIT Mystery Hunt, an East Coast event on which the Microsoft hunt is based. It requires several people to sit around a table following a very long list of instructions that rely on one another. This hunt’s Duck Konundrum involves keeping track of five crazed ducknappers around the map on the board game Ticket to Ride. While five team members hole up in a conference room with the toy ducks several people thought to bring, one of us skulks off into a quiet hall deep in the bowels of Microsoft with seven colors of pencils, an energy drink, and the Slitherlink of Doom. “THE DUCK IS DEAD!” comes a triumphant holler from the main HQ. The Slitherlink, after a great deal of effort and a few more energy drinks, is also dead, and our team congregates for a Whistle Stop. 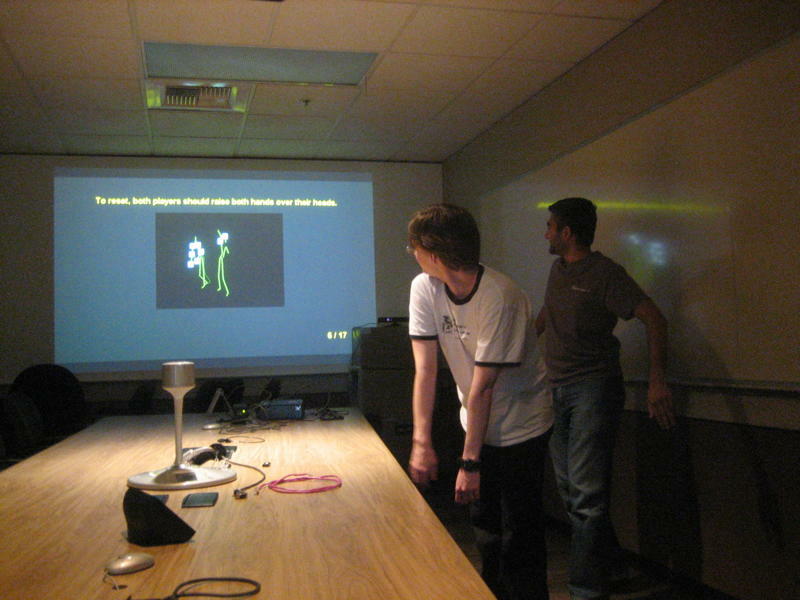 Whistle Stops are puzzles designed to be projected on a large screen and solved by the team as a group. They’re fun and easy, and they provide a much-needed break from the more intense solving of the round puzzles. One Whistle Stop is based on spoonerisms, cluing phrases like “shake a tower” that require us to switch the initial sounds to come up with the answer, TAKE A SHOWER. Another involves analogies. This one, a Whistle Stop in Pittsburgh, involves identifying board games. Our team is heavy on tabletop nerds, and we wipe it out in just a few minutes. We hit Washington, D.C. and, a few hours later, Boston. A puzzle about D.C. subway stops gets a good laugh with the clue “Orgasms” for the answer CONGRESS HEIGHTS. Another puzzle is based on the webcomic xkcd—we find out later that GC tried to get the comic’s creator to draw them a custom sketch for the hunt, but were denied. As we solve more round puzzles, we gradually receive bits of information that help us solve the metapuzzles. In many puzzle hunts, the answer words from the individual puzzles are used in the metas, but in this one, we’re given bits of metas depending on how many puzzles we’ve solved. The first meta is based on word squares, and the second on the board game Ricochet Robots. Each of these answer submissions gives us a new video depicting villains being interrogated about the whereabouts of the Space Needle. The third meta is our downfall. We’ve received strips of paper with crossword clues on them, and used coffee stirrers to build them together into a structure we’re told is called a “quintetrahedronicon.” We’ve extracted a message instructing us to string yarn through the structure in certain ways and then touch our noses to it in order to view the final answer. We think we’ve done everything right, but following the directions results in a series of bewildering yarn shapes that make no sense. While we’re trying other things and waiting for inspiration to strike, we tackle the rest of the unsolved puzzles. The answers crash down one by one, propelled by our meta-fueled frustration. The Social Network logic puzzle, which has been stagnating on the in-progress wall for hours and hours, eventually falls when we realize we must actually friend the character in the puzzle with a real Facebook account in order to see the final piece of the puzzle. Nickel Backtrack, a very clever physical puzzle involving sliding a nickel around a piece of wood to escape a maze of glued-down pennies, finally collapses with the realization that the years of the pennies are relevant. Around 4 PM on Sunday, when there’s only one round puzzle left unsolved and most of us are about ready to give up, we figure it out. We’re doing everything right, like we thought we were, but the yarn letters aren’t visible when the viewer’s nose is touching the quintet-cetera. From several inches above and back, the letters become clear. We type in the answer and are rewarded with our final video. It leads us to a parking lot just across the street from our HQ, where we witness a showdown between two of the Needle-pilfering villains. Our final challenge is a box sealed with two combination locks. When we use the keyword from the showdown scene to open the locks, the top of the box comes off to reveal a little metal sculpture of the Space Needle. With only an hour and a half to spare before the event’s wrap-up ceremony, we’ve finished the entire hunt. We are the sixth and last team to do so. The top three teams are each awarded a bag of wooden train whistles. The top spot goes to our rival team, Death of Dr. Zero, who, as it turns out, failed to extract the misleading part of the message about nose-touching. That meta, we learn at the wrap-up, was never successfully test-solved from beginning to end. We’re bummed about that, but we’re proud of ourselves for finishing the hunt. Our team worked wonderfully together, and overall we enjoyed the event. “Did anyone bring their quintetrahedronicon?” asks one of the hunt organizers. We look at each other and grin, remembering the joyous laughter and cheers that rang out throughout our HQ as one of our teammates tossed our carefully taped contraption to the ground and stomped it to smithereens.